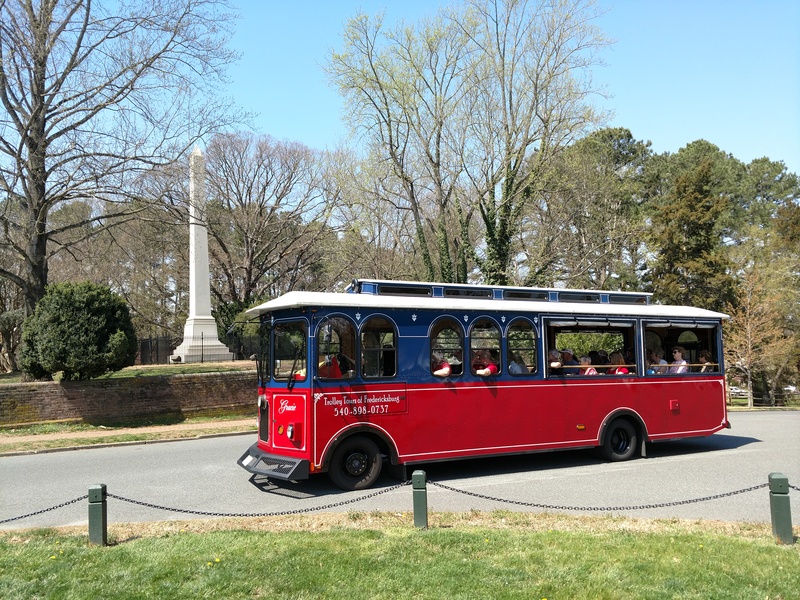 The daily downtown trolley tours start at the Fredericksburg Visitor Center, located at 706 Caroline Street in Fredericksburg, VA.
Tickets for the daily downtown tour may be purchased online until 9:00 AM. 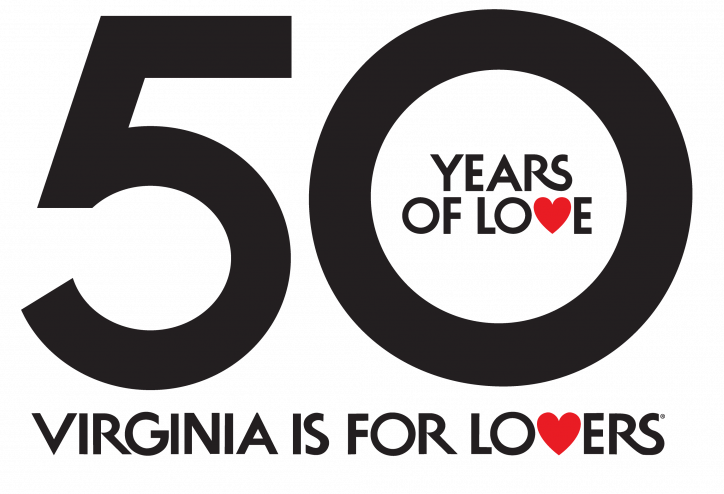 Then same-day tickets are sold at the Fredericksburg Visitor Center. Start your visit with a ride on the trolley, and get an overview of all Fredericksburg has to offer. Then you will have a better idea of where you want to eat, shop, and explore. During your 75-minute guided tour of the downtown Historic District and the Fredericksburg Battlefield, you will experience the past, present, and future of a city so rich in history and teeming with monuments, markers, and attractions. Enjoy the many unique shops and restaurants still operating in buildings hundreds of years old! In addition to our award-winning downtown tour, the trolleys and shuttle bus also are available for chartered services: wine tours; brew tours; private group tours; weddings, receptions, and rehearsal dinners; family, school, and military reunions; birthday and retirement parties; corporate team building events; home-school groups; and shuttle services throughout the entire Fredericksburg region. ** Closed Easter Sunday, July Fourth, Thanksgiving, Christmas Eve, Christmas Day, New Year’s Day. To schedule a privately chartered group tour, call us directly at (540) 898-0737. Children younger than 5 may ride free. However, they will need to sit on a parent’s lap if the trolley is full. Public tours to wineries, breweries, and distilleries typically depart from Spotsylvania Towne Centre. There also is the option of being picked up from select area hotels. Tickets for these public tours must be purchased online in advance. Relax and let us do the driving. Fredericksburg and the surrounding region have numerous award-winning wineries, breweries, and distilleries. We offer public Wine Tours and public Whiskey, Wine, and Brew Tours. We also are available for private group tours. 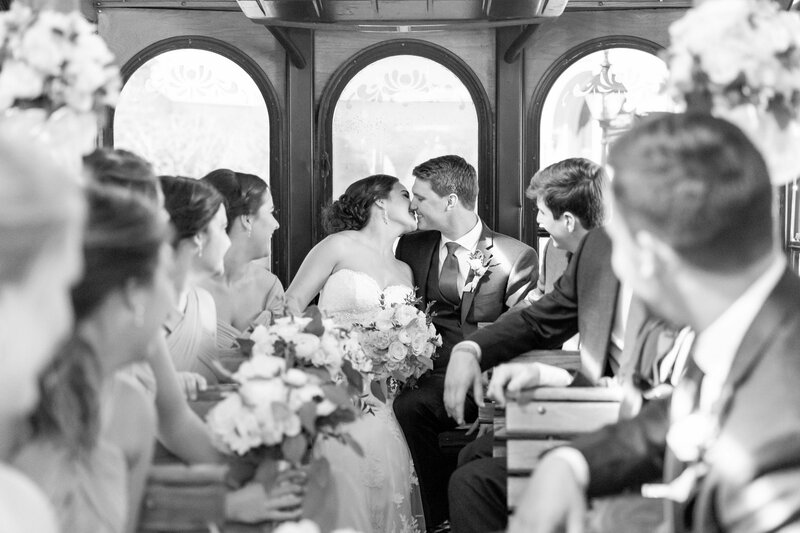 Trolley Tours is always proud to take part in a couple’s special day. Since 1994, we have provided safe, courteous service. Travel to the wedding in style. We can transport the wedding party, the guests or both! People of all ages love to ride the trolley. “I want to thank you for the remarkable job that your drivers did for our daughter’s wedding. Neither the boys nor the girls were ready on time. Your drivers saved the day and got the bridal party to the church on time. 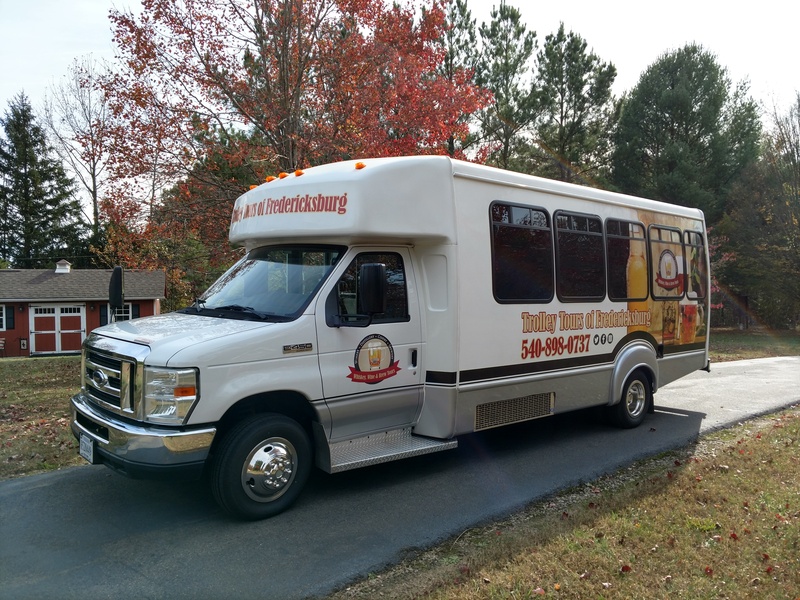 We received several compliments on the trolley service.” –Anne B.
of all ages and from all parts of the world.